David Brandt, Washington County, brings energy and enthusiasm to every GIS activity and event that he participates in or attends. There are several committees, task forces, user groups, and projects that benefit from David’s participation and leadership. Some of those include the following: MN GIS/LIS Board of Directors, Metro GIS Technical Advisory Team, Metro GIS Coordinating Committee, the Governor’s Council on Geographic Information and the City of Stillwater Parks Board. Always eager to help, he has volunteered at events from the local to national level and has provided GIS support in the event of natural disasters such as tornadoes and floods. Mentoring comes naturally for David as he has trained hundreds of users in the use of GIS applications and has presented at numerous conferences. 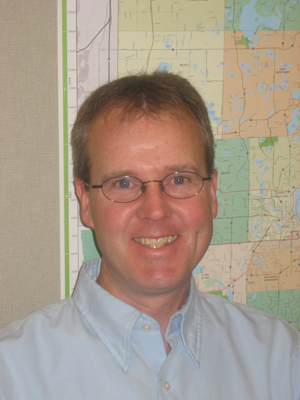 He has also taught Advanced GIS at the University of Wisconsin, River Falls. By staying current on GIS technology, researching GIS needs and industry trends, he has gained an outstanding vision of how communities can benefit from GIS. 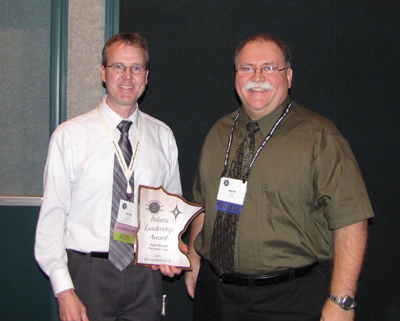 David is truly a star in the Minnesota GIS/LIS community. 2009 Polaris Award recipient David Brandt with nominator Mark Sloan.